Happy July 4th! Hear Jeanette and Nelson sing! Nelson Eddy and Jeanette MacDonald were patriotic Americans. During World War II, Nelson worked as a spy while on an overseas singing tour; Jeanette received a medal from FDR for raising over $100,000 stateside, auctioning off encores at her concerts. Jeanette sings the Star Spangled Banner. 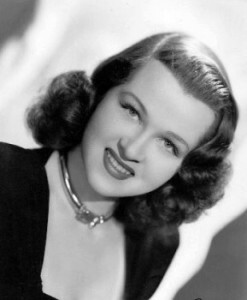 Jo Stafford, 90, recorded with Nelson Eddy in 1951, listen to mp3s here! Singer Jo Stafford passed away on July 16, 2008. As a young girl, she wanted to be an opera singer but during the Depression years, she sang with her sisters in a pop group – “The Stafford Sisters.” She later sang with The Pied Pipers. Song of the stars she worked with included Tommy Dorsey, Frank Sinatra, Frankie Lane, Johnny Mercer, Gordon MacRae and – Nelson Eddy! Click on the links of the February 23 recordings to listen to or download mp3s of these songs. music directly onto your computer. If you would like to also download the original artwork from these releases, I recommend a wonderful website that not only has the artwork (and same music but split into several smaller files) from these two albums, but from many children’s records that you may fondly remember. Check out their site here. Jeanette’s "Cinderella" is on the 2005 page, Nelson’s "Willie" is on the 2006 page.